PYONGYANG, North Korea — North Korea on Saturday expressed anger at United Nations Security Council discussions over a statement denouncing the country's latest submarine-launched missile test. North Korean Foreign Ministry official Jon Min Dok told Associated Press Television News in an interview that the U.S.-led discussions at the U.N. were a "terrible provocation" and that the country is developing nuclear weapons because of "outrageous nuclear intimidation" by the United States. Jon spoke just before the Security Council concluded the discussions with a statement strongly condemning all four North Korean ballistic missile launches in July and August, calling them "grave violations" of a ban on all ballistic missile activity. The statement came after North Korea fired a ballistic missile from a submarine off its eastern coast on Wednesday. South Korean defense officials said the missile was tracked flying about 500 kilometers (310 miles), the longest distance achieved by the North for such a weapon. Jon said that the latest submarine-launched missile didn't cause any harm to the security of neighboring countries. He said it showed North Korea's "great power and inexhaustible strength in the face of the trials of history and the challenges of our enemies." "The best way for the U.S. to escape a deadly strike from us is by refraining from insulting our dignity and threatening our security, by exercising prudence and self-control," Jon said. North Korea already has a variety of land-based missiles that can hit South Korea and Japan, including U.S. military bases in those countries. Its development of reliable submarine-launched missiles would add a weapon that is harder to detect before launch. 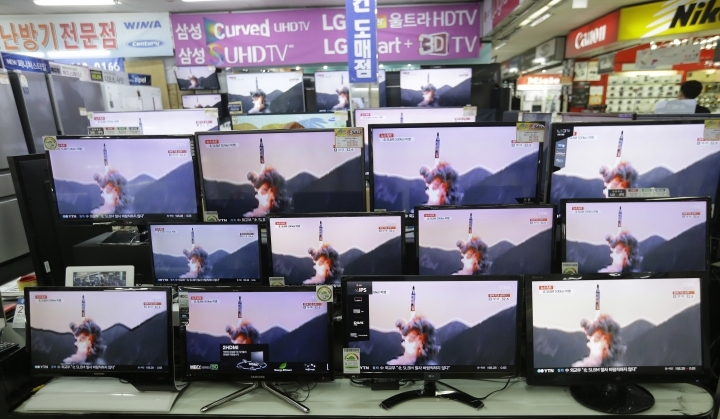 Wednesday's launch was the latest in a series of missile, rocket and other weapon tests this year by North Korea, which is openly pushing to acquire a wider range of nuclear weapons, including those capable of striking targets as far away as mainland United States.